Stay at this Biloxi, Mississippi hotel featuring deluxe accommodations and southern hospitality. 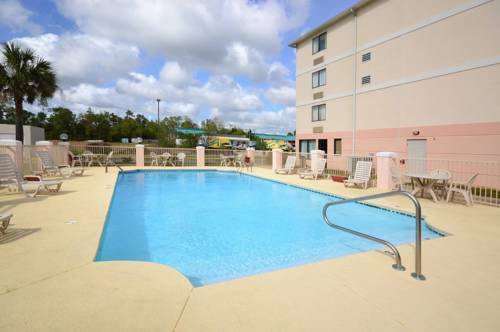 The Best Western Plus Cypress Creek is conveniently located on the Mississippi Gulf Coast near the popular Casino row and many historic locations around Biloxi. Our hotel offers easy access to recreational opportunities including fishing, beaches and golf. Our hotel guests will also appreciate the variety of nearby dining and shopping options. Each spacious, well-appointed guest room features all the little extras that make a big difference while traveling such as high-speed wireless Internet access, iron/ironing board, coffee makers, in-room safes, and microwave and refrigerator. Other special hotel amenities include a complimentary deluxe hot breakfast with waffles, omelets and sausages, fitness room, outdoor pool, meeting rooms and banquet facilities. Whether spending the day sight-seeing or relaxing on the beach, our friendly staff is ready to ensure you a comfortable and memorable stay. Make an online reservation today at our Best Western Plus Cypress Creek in Biloxi, Mississippi. Enjoy your stay. From: Interstate 10. If driving Westbound, Take Exit 50 and proceed north off of the exit. The Best Western Plus Cypress Creek is on the left side of State Route 609. If driving Eastbound, Take Exit 50 and stay in left off ramp. Take left under I-10 and hotel will be on left ahead.